At Fine Art Shippers, we can ship a painting of any size, shape, and weight. We can even ship a shredded painting if necessary. While this may sound a bit strange, our ability to ship a painting in its shredded form is now as relevant as never before because Banksy has recently created another piece of art history, and yes, it is a shredded painting. Fine Art Shippers has been handling and shipping fine art since 1995, and over these years we have seen many unusual and interesting art pieces, including works by the well-known British street artist Banksy. Our team of professional art handlers in NYC was even responsible for the Banksy mural removal in Brooklyn. This incredible artist, whose identity still remains a complete mystery, always creates true stencil art masterpieces that are additionally filled with political and social commentary on everything from global warming to refugee crisis. Banksy never ceases to amaze us with his art. Moreover, when you think that he cannot get any better, this elusive artist comes up with something absolutely mind-blowing like the hidden shredder within the frame of his painting. 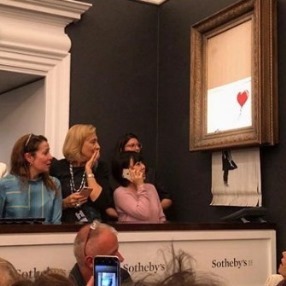 On October 5, Banksy destroyed one of his paintings right after it had been sold at Sotheby’s London Contemporary Art Evening Auction for almost $1.4 million. The famous artwork titled “Girl with Balloon” was shredded by a hidden mechanism built into a frame by the artist himself several years ago. The painting was destroyed. However, the trick is that it is now worth more than original. After all, it is the first work ever created during a live auction, making it an important piece of art history. “Girl with Balloon” was renamed to “Love Is in the Bin” and went on public view at Sotheby’s gallery in London. Banksy is indeed a genius! It is needless to say that we would be happy to ship a painting like that!